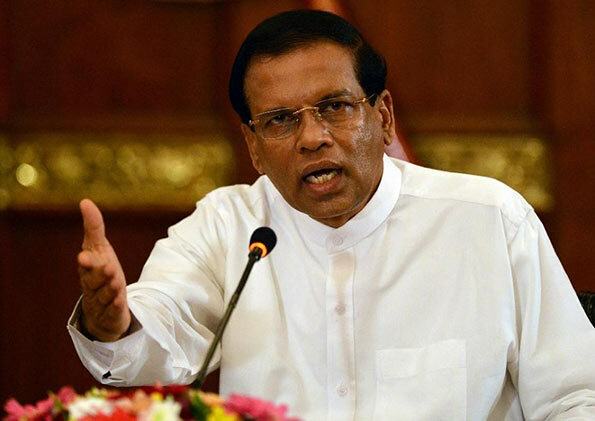 President Maithripala Sirisena has reiterated that he will not have international judges on the bench for the investigation into allegations of human rights violations during the final stages of the war between government troops and the LTTE. Addressing the National Law Conference in Wadduwa yesterday, Sirisena said: “I will not agree to get foreign judges in to any kind of investigations into human rights violations allegations”. He said he had the fullest confidence in the local judges and judicial administrators, so there was no need for international judges. According to the UN human rights council resolution of 2014, Sri Lanka was to set up an international mechanism to probe the war crimes charges. Sri Lanka co-sponsored the 2015 resolution with the US which also called for a mechanism with international judges and prosecutors. The UN rights chief Zeid Raad Al Hussein in his report submitted at the September 2015 session of the UNHRC blamed the local judiciary for its lack of capacity to deliver justice, PTI reported. I salute HE Sirisena for this. Yes, we do not need foreign judges and we have to rely on our legal system. If we need foreign judges we are somewhat saying our legal system is not up to standards to deliver justice. Then, what about thousands of legal cases taking place in our country? Do we think the verdicts given are wrong? Are we going to undermine our legal system and the judges and bring foreign judges to take their places. Folks who advocate getting the service of foreign judges might say ‘if we have nothing to hide why we are afraid of foreign judges & investigators?”. Well, Sri Lanka is still a sovereign nation and those who press Sri Lanka for foreign judges & investigators never helped us when the terror outfit LTTE is committing atrocities. SL took care of the terror war and it can take care of the investigations. Oh! Just don’t take it seriously what Fonseka said about wanting international participation. He is only paying back the price of the minister post by trying to scare Mahinda Rajapaksha. I think the Field Marshall is correct. He is a professional soldier. He created a professional army with proper chain of command and proper training on discipline. Unfortunately, the war was managed by a low ranking officer who held a top position in the Defence Establishment. Fonseka was denied of proper resources; however “underground” resources (nerve gas and chem weapons) from the backstreet’s of Ukraine were provided to the forces bypassing the Commander Fonseka. An international enquiry will unveil all these “behind the door” transactions and empowerment. In fact, in the last months of the war, Fonseka was sidelined to the extreme and perhaps, that was the reason for him to fly to China in the last days. Fonseka was a man trapped between a rock (concluding the war) and a hard place (The R Brothers directly managing the war) in the last phase of the war. Now, the ******* does not want foreign judges because he wants to protect the top commanders in the army who were directly responding to the R Brothers in carrying out an unethical war according to international conventions. Maybe, the ******* also fears an Army takeover of the Civil Administration if SL proceeds further in accordance with the UN resolutions. Maybe, the ******* is also relying on the draw card that he protected the “Ranaviru” in a future election where the SLFP stands alone. Mr. Philip Chandra, You contradict yourself. You said SF is professional solder and created a professional army with proper chain of command and proper training on discipline. On the contray you say however “underground” resources (nerve gas and chem weapons) from the backstreet’s of Ukraine were provided to the forces bypassing the Commander Fonseka. How can this be? I am confused.